Okay, this is by far my dullest Tula Tuesday post to date. The 2 simplest blocks to date- 9 and 10- are all I have to show you. But! Blocks 9 & 10 are done, and that means I stuck to my 10 blocks/month plan, at least for the first month! Hooray! Once again I featured that Dowry print I love so much. 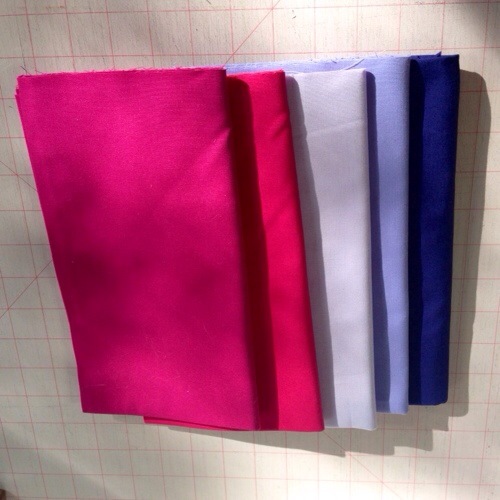 It’s amazing how different the fabrics look with different solids. 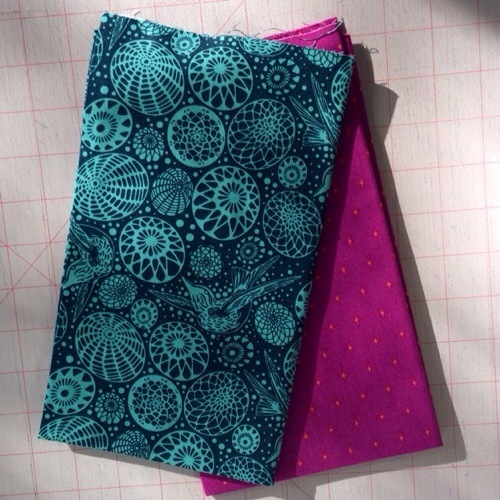 That Tula Parisville print in the center looks so different in Block # 6, where I paired it with deep purple. Don’t forget to come back next week when I’ll kick off the Tula Tuesday link party! Looking forward to seeing everyone’s blocks… Grab a button and come back next week! 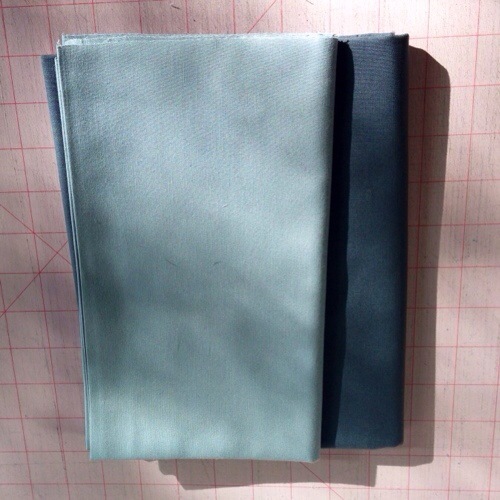 The backing fabric arrived last week. And I pieced the back with just a little bit of the greens from the front. It took my husband and both kids to hold it up for a quick pic. We probably could have done it without Henry, but he didn’t want to be left out. Who can argue with that? I had planned to use more of the green prints, not just the solids, in the back, but I only had tiny scraps of some of them left. And I quite of like the strong graphic impact of these bands of solid greens. You’d think with a 3 day weekend, I would have gotten more done. But Saturday was cleaning day, and Sunday was for Trader Joes, and Monday we wasted over an hour in the waiting room of Henry’s doctor, who was over an hour late for our scheduled appointment, with no apology. Ugh. Which meant moving all the furniture in my living room. I’m feeling like a moron, because this was my best basting job ever. The back is sooooo smooth. Like buttah. Because I finally realized, thanks to Sunday Morning Quilts, that I needed to be using way more tape when I stretched my backing out on the floor, and place the tape way closer together. Duh. So obvious, but not to me! How would YOU quilt this? Especially if you were me, and you do not have FMQ skillz? We’re talking walking foot straight line action over here. Not to mention, wrestling a 60×72 quilt through my Viking… I’m setting the bar low, but I would appreciate any and all ideas. I had been thinking of a crosshatch patter in the greens, and either echo quilting the skull to make it stand out, or a smaller, tighter crosshatch in the skull. I picked up green thread and white thread over the weekend, as well as black for the back. Linking up with WIP Wednesday over at Freshly Pieced, and looking forward to seeing what you’ve all been up to. Blocks 7 and 8 both contain a multitude of teensy squares. I’m sure these are less square than the ones that came before…so much room for accuracy to be lost with those tiny bits. Block 7 is very, very green, with that dowry print I love so much in the corners. Block 8 incorporates some more Tula, from the Nightshade line. I’m a bit worried the colors of the print are so much flatter than the other blocks so far, but I do love that fabric so very very much. I also used that brand new houndstooth I just showed in in Sunday Stash. 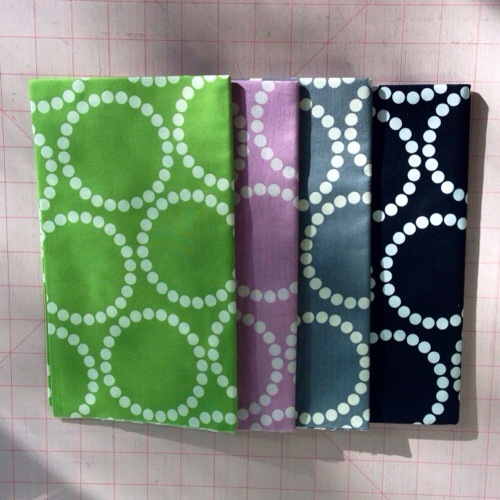 From my post last week, it sounds like some of you WOULD be interested in taking part in a Tula linky party. Here’s my plan: start Tuesday, March 4th. I’ll host the link up- if anyone out there is great at button making, I’d love help! Folks will be welcome to post any Tula city sampler progress they have made, and of course, will be encouraged to visit and comment on others’ posts. Of course, we all want to see what everyone else is up to, so that should be easy! I’ll leave the linkup open through the week, and we’ll start the whole thing over the next week. If so, help me spread the word- and I’ll try to get a button ready ASAP to help with that. Meanwhile, let’s end with my progress to date… 2 more blocks and I’ll be done for February. Here I am, a little bit late for Sunday Stash, but with loads to show. 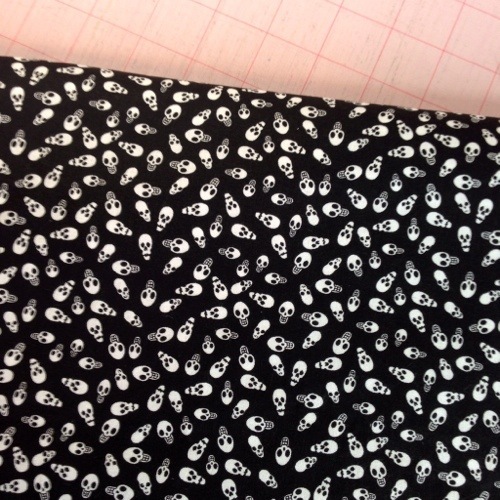 First off, we have the backing fabric for my super sized skull quilt. Not sure who the manufacturer is, but I bought it from Fabric.com for $7/yard. 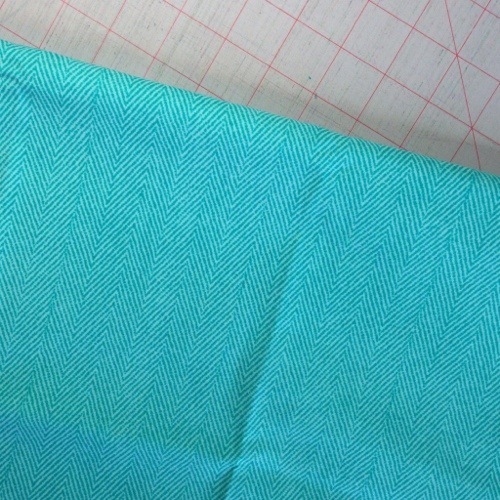 Next, a lovely turquoise herringbone print, from AE Nathan. This will certainly end up in my Tula Pink City Sampler blocks, and probably many other projects as well. Now we have another turquoise, again from AE Nathan, called “fancy peacock birdcages.” This one is also planned to end up in my Tula blocks. And finally, the ultimate impulse buy. This afternoon, I stopped into Holly’s Quilt Cabin, one of my LQSs, to pick up green thread for quilting the skull top. And I had to get a yard of these Riley Blake zombies! They’re so darn cute. And they go with the turquoise herringbone fabric perfectly! Linking up with Sunday Stash over at Molli Sparkles. 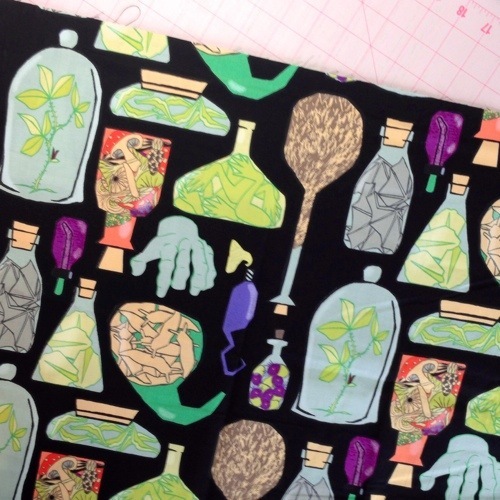 Here’s hoping you had a fun fabric week, too! I might just have made the largest baby quilt ever. When I started the quilt, I intellectually knew it would be big. 60″x72″. But those were just numbers in my head. I didn’t think, hmm, isn’t that 5 feet by 6 feet? I did think about cutting all my pieces 1/2 the recommended size, but that seemed too fiddly. 1.25″ strips didn’t sound fun to work with. And then I thought about only making the center, skull portion of the quilt, but that was too boring. See what I mean? Mixing up the greens in the center blocks would have detracted from the skull, and the 2 solid greens by themselves bore me… Plus the skull seems off balance somehow. So, the biggest baby quilt in the world it is! 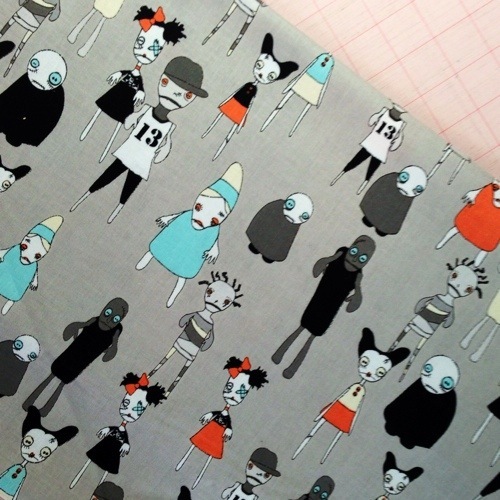 I did cave in and order some new fabric for the back- I found some perfect stuff on http://www.fabric.com for $7/yard on sale, so, yeah, I bought it. It’s due to be delivered today, so maybe I can piece the back- I’m planning on mixing in some of the leftover solid greens- and baste it over the weekend. Have you ever given a quilt this big to a baby? Do you have a go-to pattern for baby quilts, or do you mix it up? It’s time for the second installment of Tula Tuesday. This week, I worked my way through blocks 3, 4, 5 and 6 (pictured in numerical order.) 5 and 6 were super duper fast- in fact, I pieced 6 while Annie was pinning her pillowcase! I actually took #3 apart once. 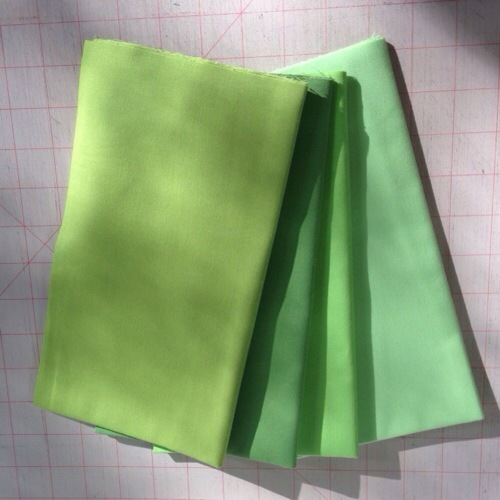 I had a green fabric in the corner squares, and I hated it. So I replaced the green with the blue Pearl Bracelets, and it was all better. 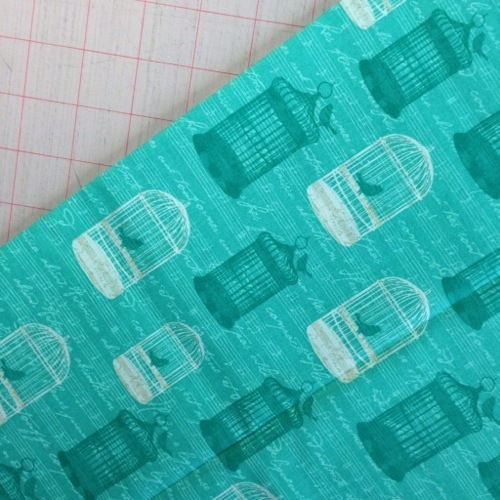 Number 4 features two of my favorite fabrics from Parisville. This upcoming week, I may not get more than #7, or maybe #7 and #8, done. There are 20 1×1 squares in block #7! That will require some attention paying and precision piecing- which are both totally my strengths. NOT. Meanwhile, I’ve got a question for you guys. Since I posted last week’s blocks, I’ve heard from several folks who are part way through or just starting their own City Samplers. Since the official QAL is over, and the prizes have been awarded (and, if you haven’t checked out the results, what are you waiting for? ), I wondered if anyone would be interested in linking up their progress throughout the year? I was thinking every Tuesday, or maybe just one Tuesday per month? It would be so much fun to see what everyone is up to, and to encourage one another along the way. You could be doing all 100, or just your faves… anything goes! Anyone up for it?